Do you thrive on helping others? Would you like to give something back to squash? Being a volunteer in squash gives you a chance to have your say in how your county, league or club is run. It’s also a great opportunity to gain new skills and meet people. We rely on volunteer stewards to help at our major events and there will be a number of different volunteer roles on offer. If you’d like to volunteer at one of our events, get in touch. 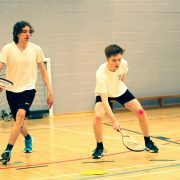 Our Squash Leaders Award, which is a three-hour course, will teach you to the basics of overseeing activity. You will be able to lead informal play sessions, games and competitions, plus find out about general organisation. To find out more about the Award, get in touch. Get in touch with your local club or for more information contact info@scottishsquash.org.